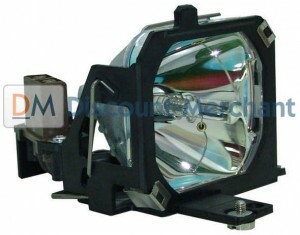 The ASK LAMP-001 projector lamp will run for approximately 1500 -2000 hours before needing to be replaced. It’s critical to buy and install a genuine ASK LAMP-001 rather than a generic lamps. Although lower in price initially, these copy cat lamps usually end up costing much more in the long run. Often advertised as “compatible” these lamps are prone to explosion and you run the risk of being exposed to the carcinogenic substance Krypton-85 used in the making of these lamps. 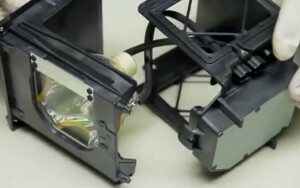 Counterfeit generic lamp damage the sensitive components since copy cat manufacturers don’t have the correct components or know-how to build a proper lamp. The light provided by these lamps is also substandard with poor illumination and can damage your eyesight. 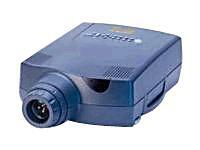 Installing a generic lamp will also void any warranty for your ASK Impression projectors. Go with an authentic ASK LAMP-001 OEM lamp sold by a dependable seller. Learn the 7 Ways to spot a counterfeit lamp. Click here for step-by-step instructions on how to change the ASK LAMP-001 projector lamp for the ASK Impression A8 projector. Click here for step-by-step instructionson how to change the ASK LAMP-001 projector lamp for the ASK Impression A9 projector. Click here for step-by-step instructions on how to change the ASK LAMP-001 projector lamp for the ASK Impression A10 projector. Looking for a less expensive option? Want more information? Watch our step-by-step video on replacing only the ASK Proxima LAMP-001 bulb instead of the entire lamp housing.